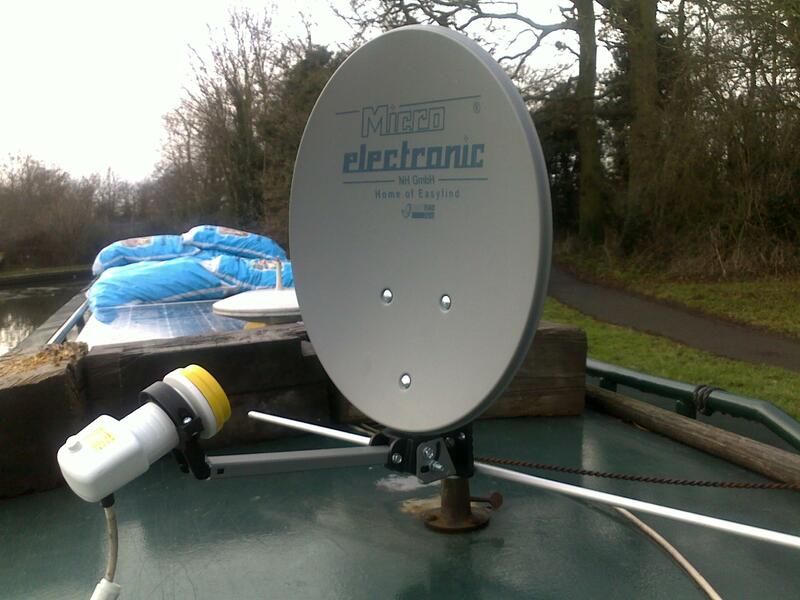 The starting position for this adaptation was an existing “Freesat” installation utilising a “sky” minidish, thus the wiring was already in place. The wiring was undamaged and good quality and was used in the new installation. The “Easy find” system includes a small LED on the LNB (the bit that receives the signal from the dish) which shows changing “traffic light” colours as you get closer to locking onto the required satellite until you get a solid green. 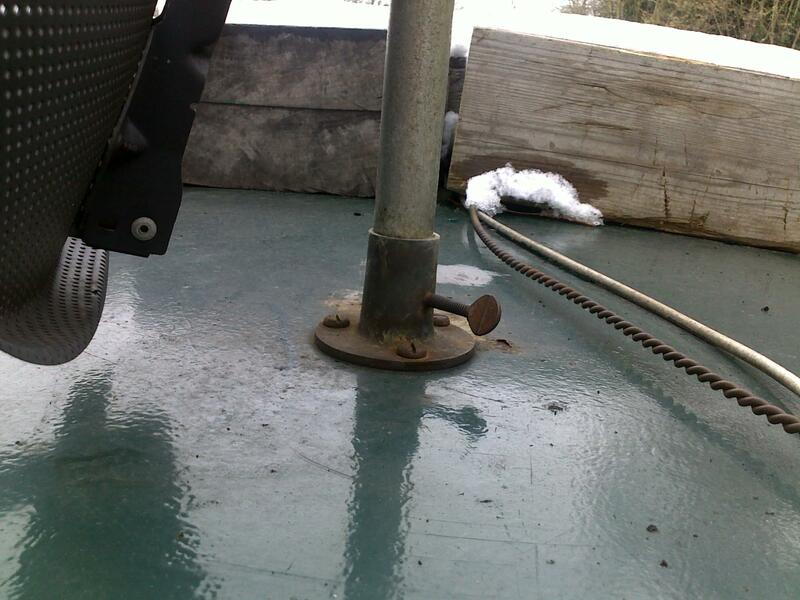 The existing system used a simple 1” mast fitting mounted on the roof, It had been drilled and tapped for a 6mm thumbscrew to lock the pole and prevent it from rotating (once the dish is pointing in the desired direction). This also allowed for rapid removal for passing under low bridges. 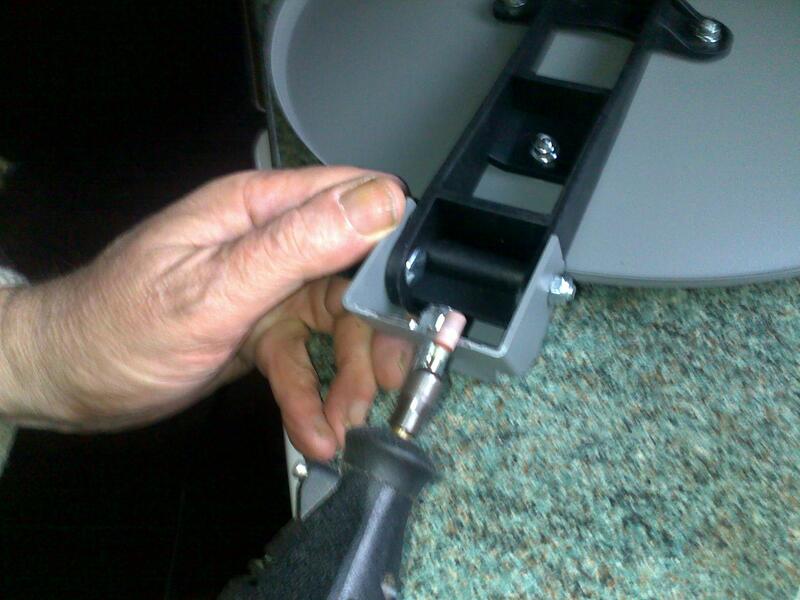 Simply loosening the thumbscrew allows removal of the whole dish. 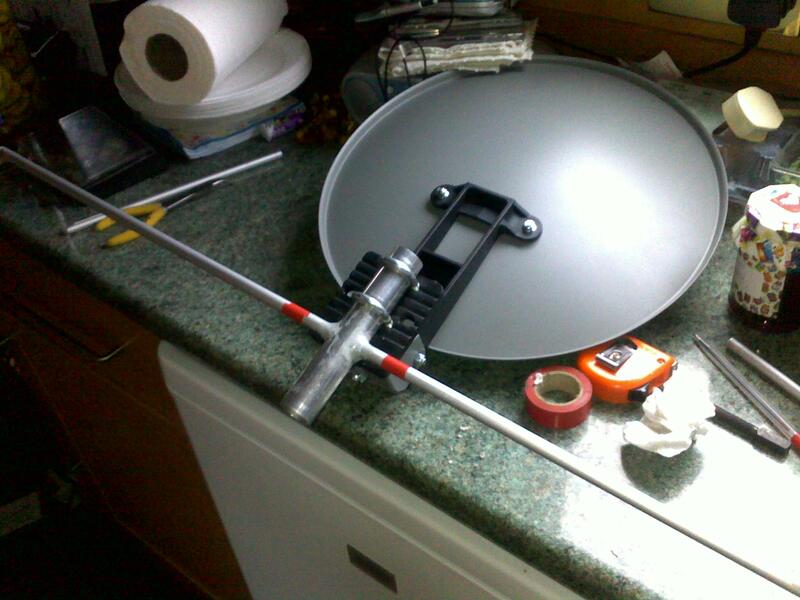 Allow one person to align the dish to the satellite quickly. Convert to “Free to Air” reception rather than being locked to a particular system. Allow any future upgrades to be at the component level rather than have to replace the whole system. This particular system was chosen knowing that it had to be heavily modified to do the job of being a permanent system. However it was considerably easier to get hold of than most others as we were frozen in at Rugby at the time. Obviously a wider choice would be available if ordering over the Internet were an option. However the ability to closely inspect the item rates highly for me. The dish seems a good quality item, however the fixings to mount it on a pole were a bit hopeless and the fixing between the arm and the LNB was incredibly sloppy. It was time to apply some re-design. 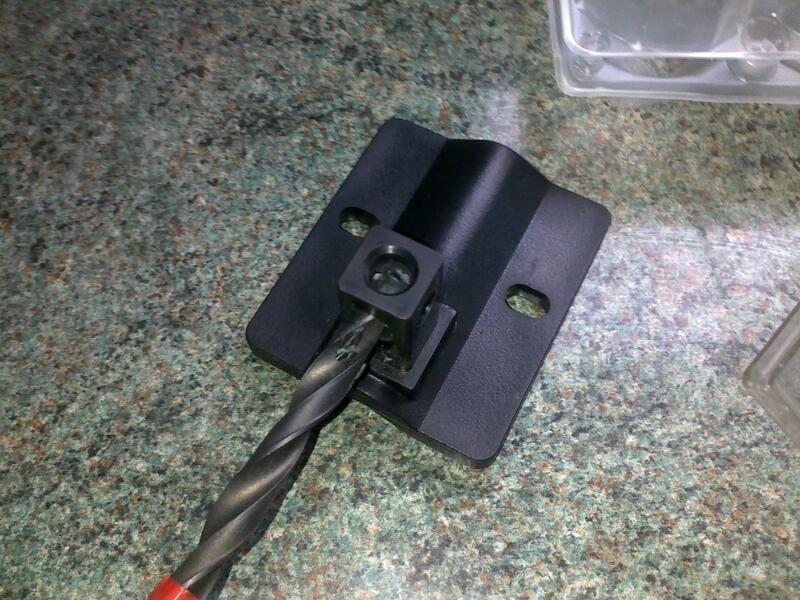 The plastic pole fixing was drilled out to 9.5mm and gently eased out to a very tight fitting 10mm with a dremel. 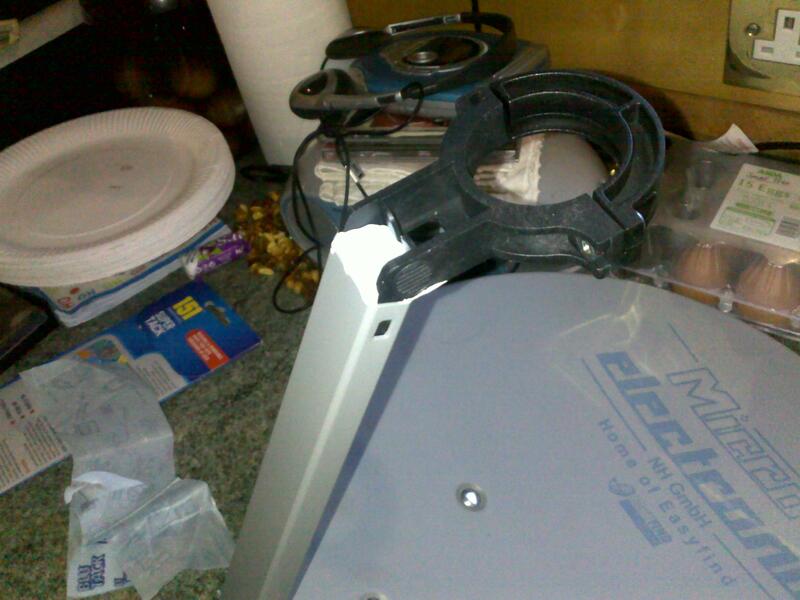 This caused the pole fitting to block against the dish base by about a 1mm. The base of the dish was eased back the required 1mm (as it was structurally much stronger than the plastic pole fitting). Shaving the odd mm off to get a good, tight fit. This then provided a strong and rigid dish to pole fitting join. A standard 10mm nut with lock washer was used to tighten the whole assembly as the hand tightened fixings supplied were not up to the job. To lower the system the fixing at the bottom of the dish assembly was reversed, so that the shaft and screw thread “pointed upwards”. The next problem was to attach the pole fitting to the pole. A fitting (“U” bolt) is supplied for this but it is only going to fit a pole of about 1½” as the threads do not extend far enough to tighten on a pole of lesser diameter. Also for a permanent fitting 2 clamping points would seem to be essential. It was time to replace the supplied “U” bolt, as due to it's shape it would be impossible to cut the threads further with a normal die. New holes were drilled and two, very close fitting, “U” bolts attached, securely clamping the pole to the pole fitting. Attention was turned to the sloppy LNB fitting, this was simply packed with blu-tack. I did not want a permanent solution (like packing it with marine epoxy) as I was not sure what the correct position really should be. The thing wobbled vertically by quite a few degrees. I will toughen it up with epoxy when I am sure what position it should be. LNB holder packed with blu-tack. I then added “arms” so that I could rotate the whole assembly slowly and precisely, without touching the dish assembly itself. 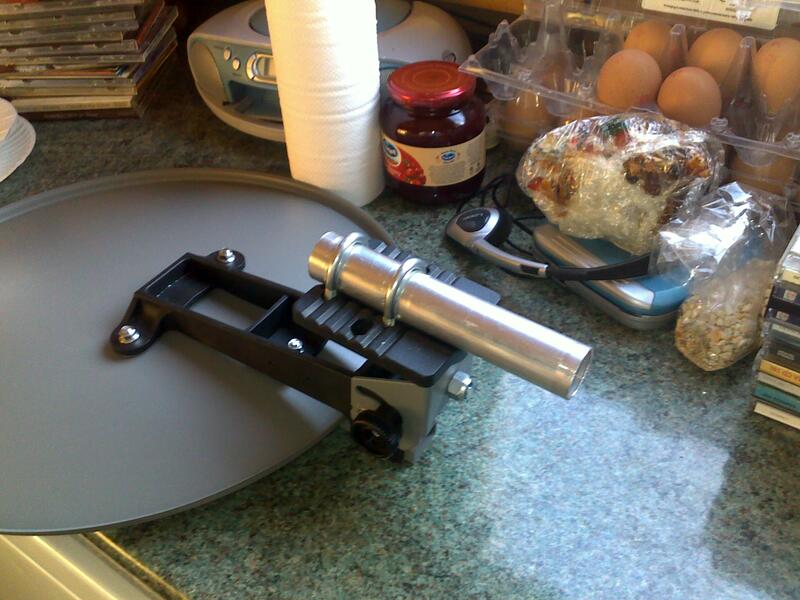 As it has to be reset every time we move this makes life a lot easier to carefully move the dish each time. The arms were 10mm aluminium tube and a screw was epoxied into each end to seal them, basically to stop insects getting inside. Having an earwig crawling over your hand while adjusting the dish would be distracting. And here it is in position and working. The LNB has a little LED which changes from red to amber as the dish nears the satellite and then to green when it is locked on. This means that a single person can align the disk in a matter of a few seconds, and does not need an assistant looking at the TV calling out the signal strength. The unit, as purchased, was designed, and built with mobile use (camping etc.) in mind. My criticisms of the fixings were something I had assessed before purchase and I knew what had to be done to turn it into a more robust system that satisfied my needs. One small problem is that the signal received as shown on by the receiver on the TV is erratic. When the LNB is, for example, pointing at a wall, or in a cupboard, it shows spurious, temporary peaks of 70-80% signal. I had the company who provided it test the LNB and a brand new one as well. This was the same on both of them so it must be a “feature” of the system. Does it all work? Certainly it all works pretty much as expected, with the exception of the signal strength readout as mentioned above. I will update this article in 3 months to give a more complete assessment based on experience, and include any modifications made. By then I should also know if corrosion of the dish is a problem.